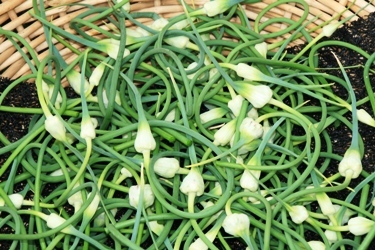 What the Heck are Garlic Scapes? This is our first season growing garlic at Grateful Plains. One might think that garlic is a high value crop, but a bulb of organic seed garlic can cost upward of $10 a bulb with 5-12 cloves in it that break out and get planted to become one bulb of garlic for sale the next season. It takes up space for 9 months and only yields one bulb per plant. We feed and water it May and June and weed it like mad all spring, contributing quite a bit of (wo)manhours to its production from its peeking out in March to digging it up late summer. That $1 price tag on a bulb of organic garlic is nearly a giveaway for a small farm like ours. However, I absolutely love garlic. I like it on everything. I like it fresh, pickled or baked and spread on homemade bread as thick as fresh butter from the churn. So we decided to grow it. And how exciting its been to watch it grow. Joel picked a bulb a week or so back and I must say, my heart skipped a beat hearing him report that is was plenty sizable to gift to his buddy venturing through the fields that day. Yet fearing more the backing down of what seemed more contentious than a double dog dare than the possible pungent punch of fresh garlic blossoms, I did it. WOW! what an incredibly mild garlic flavor. The firm stem reminded me of a yard long bean, a bit firmer and more meaty than a scallion, but tender with a pointed crown that sealed bulbous purple seeds beneath. Wowza, indeed. What am I going to do with these? With a quick google search I found quite a few options, and I am really thrilled my love affair with garlic has us growing a dozen different types, with plenty of scapes to go around this week. I hope you’ll share your photos and videos with me when you discover this edible bloom in your shares for Week Six of the Grateful Plains CSA in Grand Ridge. It is our little gem with so much loss from the flooding the past month. I ADORE garlic scapes. The single biggest thing I miss about subscribing to a CSA, as they are hard to find at farmer’s markets around me. Delicious! Thanks for linking to my recipe.